Diary of a Wimpy Kid: Do-It-Yourself Book Puffin Now everyone can have their own Wimpy Kid diary! Draw your own Wimpy-Kid-style cartoons, fill in facts and lists, check out the full-colour comics inside and even write your own Wimpy Kid journal, just like Greg. Now with dozens of pages of new content and a brand new cover! Аннотация к книге "Diary of a Wimpy Kid: Do-It-Yourself Book"
Now everyone can have their own Wimpy Kid diary! Draw your own Wimpy-Kid-style cartoons, fill in facts and lists, check out the full-colour comics inside and even write your own Wimpy Kid journal, just like Greg. Now with dozens of pages of new content and a brand new cover! –27 % Выгода 158 ₽ It s a long way. Самоучитель английского языка для детей и родителей. Часть 1 15 рец. 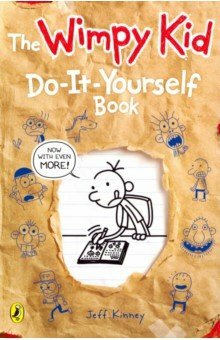 Если вы обнаружили ошибку в описании книги "Diary of a Wimpy Kid: Do-It-Yourself Book" (автор Jeff Kinney), пишите об этом в сообщении об ошибке. Спасибо!